If you need some expert advice or have a question about our services, feel free to ask. We will respond within 1 hour during our working times. Spend over £150.00 to enjoy a discount. In Stock Goods in stock for immediate dispatch. Please select your delivery date when confirming your order. Your material will be cut with a high precision TCT blade, this removes 5mm of material on each cut. Your order will be cut to a standard tolerance of - 0mm/ + 1mm. 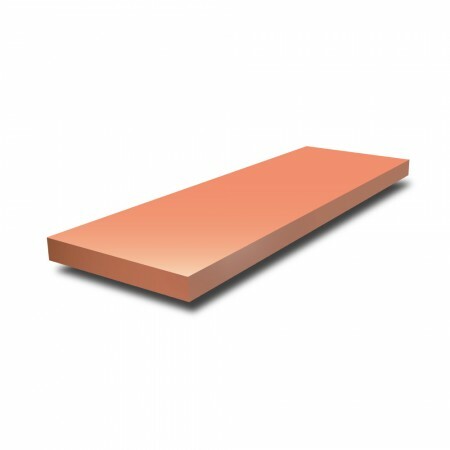 Copper Flat Bar now available in grade C101. Copper is corrosion resistant with high impact strength. This material is known as ‘HC’ meaning highly conductive of both electricity and heat. Both hot or cold working is possible.